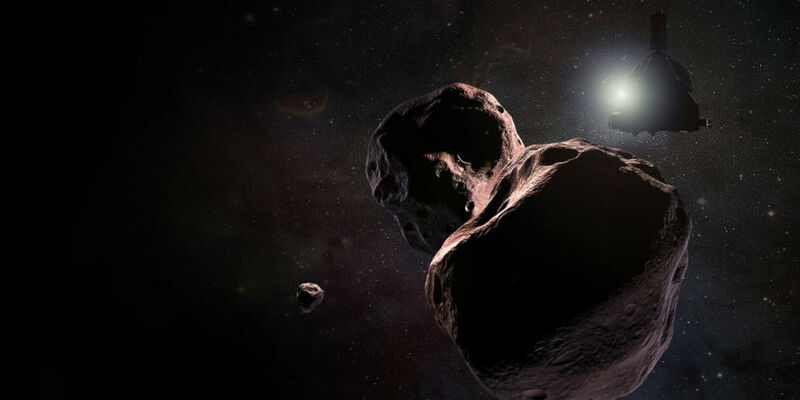 Our campaign tonight, August 14th, involves Pluto, a dwarf planet with an atmosphere. The nature of the experiment is a bit different from what RECON is mainly designed for. 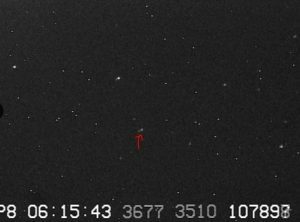 For an opaque object, a positive detection will look like a sudden dimming of the star, followed by a sudden back-to-normal brightness. If you put an atmosphere around an object, then part of the light is refracted away from us by the atmosphere (because its refraction index is different than 1), and some light is also refracted toward us. If an observer is close to the central line, the atmosphere acts as a magnifying glass and the refracted light is concentrated. This is called the central flash. 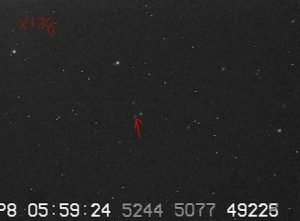 For a brief time, the star will look even brighter than when not occulted, i.e. you see a ‘flash’. The central flash allows us to study the lower atmosphere of Pluto, a few kilometers above the surface. Is Pluto’s atmosphere finally collapsing? Did you know that the atmosphere has been expanding and this could be the first time we detect a change in that trend? Our role is to give a correct interpretation of the central flash. It is necessary to know where the central line is very precisely – down to single kilometers. 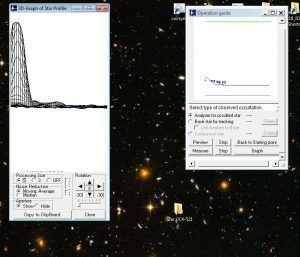 This is possible if we have a good sampling for the whole atmosphere. And we have the right network for that, RECON! According to the prediction, we could sample a big portion of the north half of the occultation, which will give a good constraint for the atmosphere modeling and also in determining if the atmosphere is finally contracting. 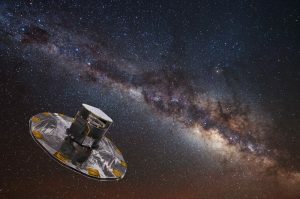 It is possible that some stations will detect gravity waves, small variations of density in the atmosphere. 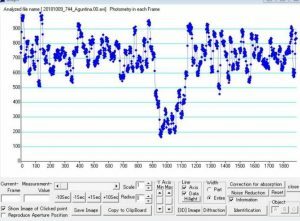 These waves are visible as short changes in brightness in the light curve during the occultation. It is a very exciting experiment! 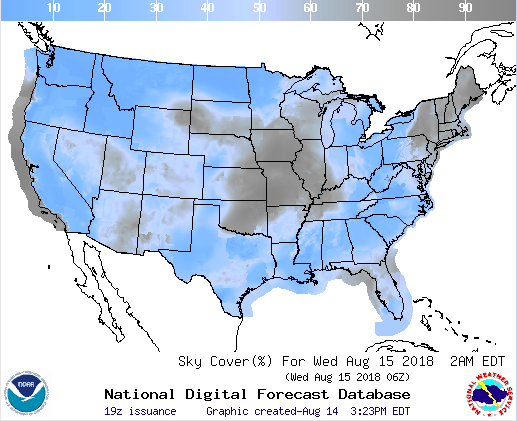 Here is the sky coverage map for around 2AM EDT. Good luck to everyone! Go RECON! Updated RECON coverage for our next official campaign: 2018 July 8 UT – Quaoar. Over the course of four nights in April and May, the RECON team was able to use Apache Point Observatory’s Astrophysical Research Consortium Telescope Imaging Camera (ARCTIC) on the 3.5-meter ARC telescope to more accurately determine the positions of 31 trans-Neptunian Objects (TNOs). The objects that were observed had high uncertainties in their known orbits that limited our ability to predict occultations. By taking three separate exposures spread out over multiple hours, each object can be seen moving across the sky relative to the stars. 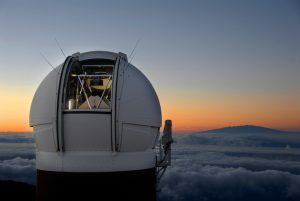 By then measuring the object’s position as it moves through the night, a more accurate orbit for the object can be defined, resulting in more accurate occultation predictions. 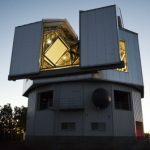 This is an important step in the occultation prediction process. 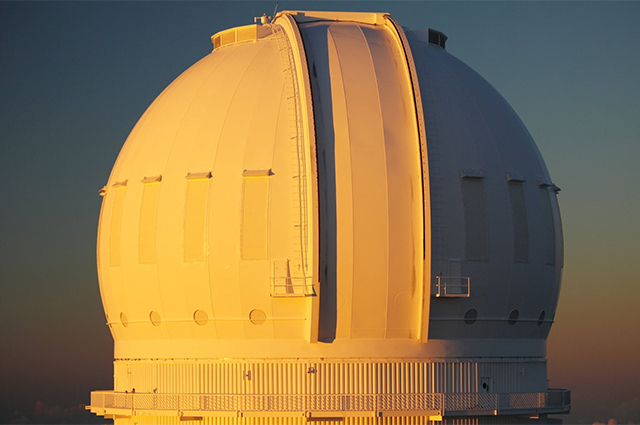 The goal of these measurements is to identify the occultation events with a nominal 30% probability of success. Drs. 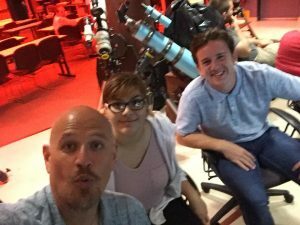 Rodrigo Leiva (RECON Postdoctoral Researcher) and John Keller (RECON Co-PI) observed at Apache Point Observatory on April 16-18, 2018. 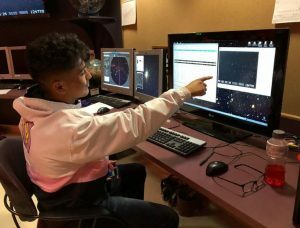 During the first night, they were trained on the APO 3.5-meter telescope by New Mexico State University astronomer Dr. Candace Gray. 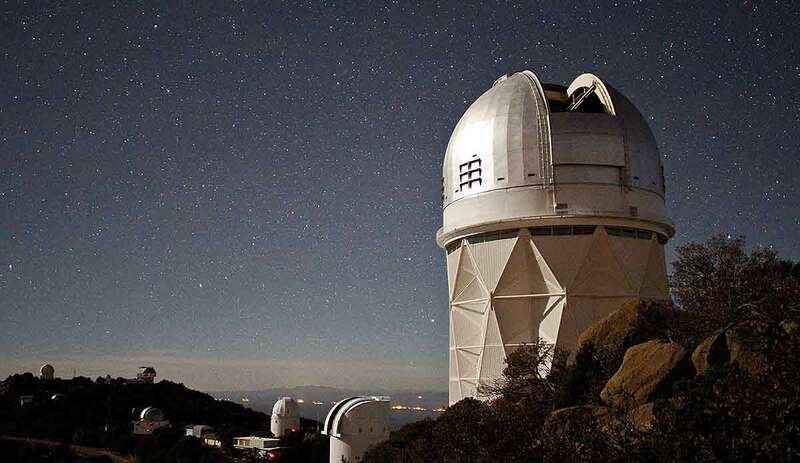 They then collected astrometry data for 14 out of 21 during the morning hours of the subsequent two nights. 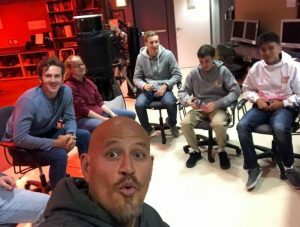 For May 18th and 19th, Rodrigo remotely observed from Boulder with help from new RECON student research assistants Sean Haley, Lizzie Wilde, and Ryder Strauss while John was in Washington DC remotely controlling the telescope. After taking flats, darks, and bias frames, science images started to roll in. 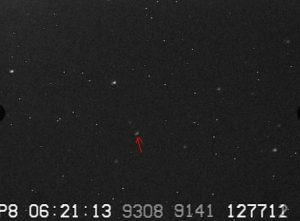 The objects observed were between magnitude 20-23 and were observed 3 times over the course of both nights. Each exposure of the same object was taken long enough apart so that the object had moved at least three arcseconds across the sky from the previous exposure. 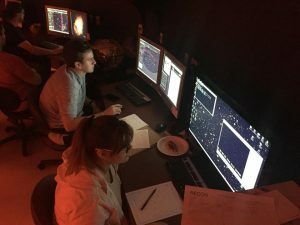 Sean, Lizzie, and Ryder looked through all the science images as they came in to make sure they were good to use (no weird light artifacts) and to confirm that the object was in the frame. 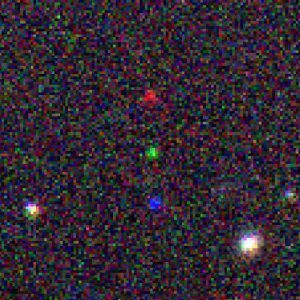 Each object was found by assigning a pixel color (red, green, and blue) to the three images taken of each object and combined to make a color image that is useful to find moving targets – can you guess why? An example of what is seen with this method is shown below. 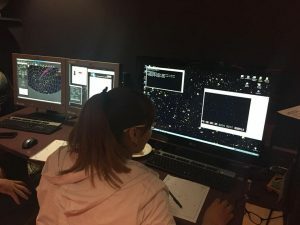 17 out of 18 objects were successfully recovered and put into the RECON occultation prediction system. 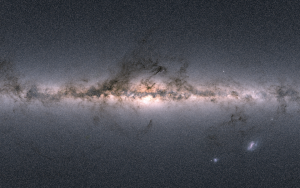 The GAIA DR2 data that measures the positions and velocities of billions of stars in the Milky Way galaxy. 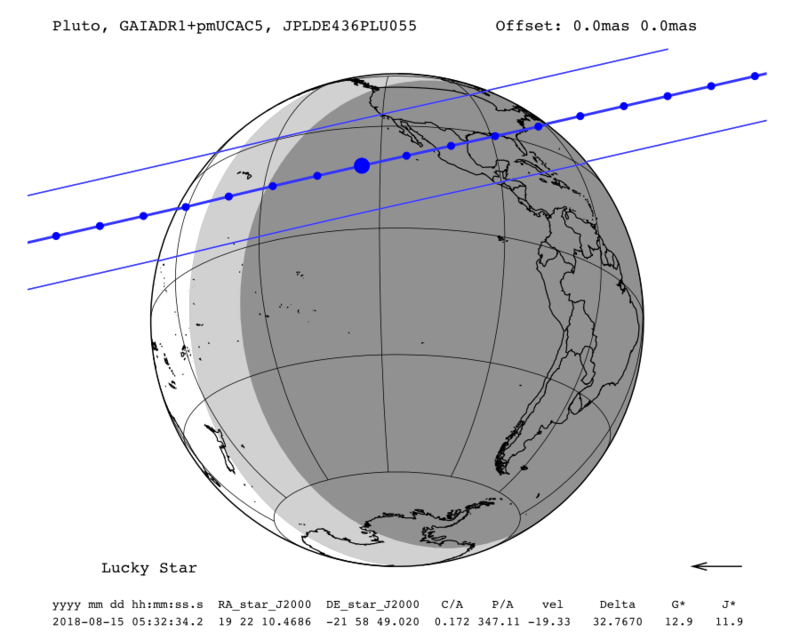 The occultation prediction system has also now been updated with the new, much more accurate, Gaia DR2 (Data Release 2) data, shown here. With an incredible increase in positional accuracy (three orders of magnitude more accurate than previously measured!) provided by Gaia, the uncertainty of star locations is no longer a significant factor in our occultation predictions. This means there are more accurate occultation predictions than ever before, which is great news for the future of RECON! Overall, 31 TNO positions were improved to bring the uncertainty in their orbits down to ~0.1 arcseconds. 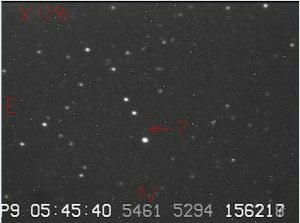 All of these objects are now updated in the system with the new more accurate orbit information gained in these observing runs. They are now accurate enough to potentially provide us with some great occultation opportunities in the future. 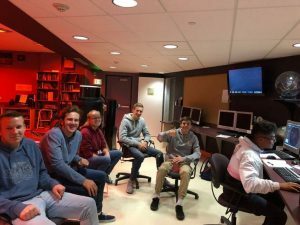 The 2017-18 academic year started off strong with our Annual RECON Team Meeting in Sunriver Oregon in late October and an occultation event in November involving Centaur 01SQ73. However, since then we have not had any high probability TNO occultation events to pursue as a network. We wanted to briefly explain why and share what we have been working on to address this. 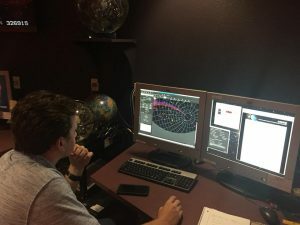 Up through January 2016, RECON Principal Investigator Marc Buie had successfully competed for routine use of the Mayall 4-meter Telescope at Kitt Peak National Observatory to monitor the positions and orbits for TNOs that feed into our RECON occultation prediction system. 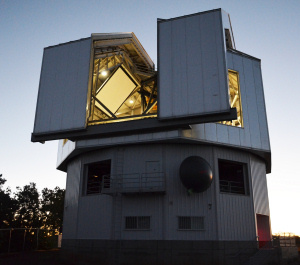 However, the Mayall Telescope has been undergoing a significant mission reconfiguration over the past two years to focus on the 3-D structure of the universe to investigate dark energy. 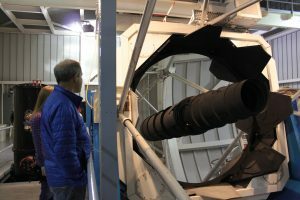 While this involves cool science, the downside has been that the facility is no longer available to RECON and other projects previously using the telescope facility. With the resulting loss of telescope time for monitoring TNO positions, we have seen a significant drop in our ability to predict high-probability TNO occultation opportunities this year. Hence, no official, full-network RECON campaigns since November. To address this, Marc Buie and Rodrigo Leiva at SWRI and John Keller (now at Fiske Planetarium at the University of Colorado Boulder) have been working over the past several months to obtain observing time on other telescopes to collect more positional data for our TNO prediction system. 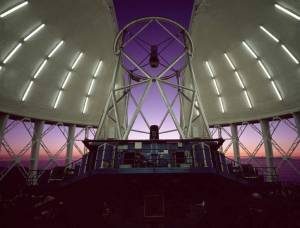 Toward that end, RECON was recently awarded 4 half-nights with the 3.5-meter telescope at Apache Point Observatory in New Mexico. Weather permitting, we hope to measure as many as 70 TNOs in April and May with this facility. 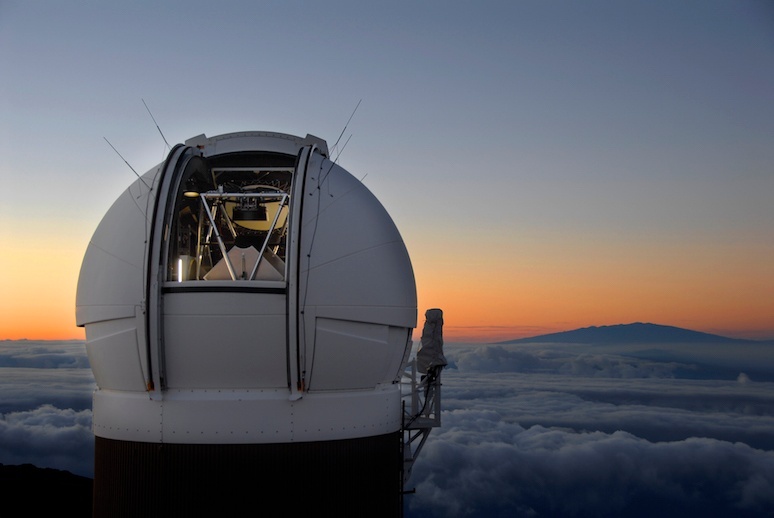 We have also obtained 4 hours for a pilot program with the Gemini North 8-m Telescope located in Hawaii. With this telescope, we expect to observe 5-6 TNOs, focusing on much fainter objects. 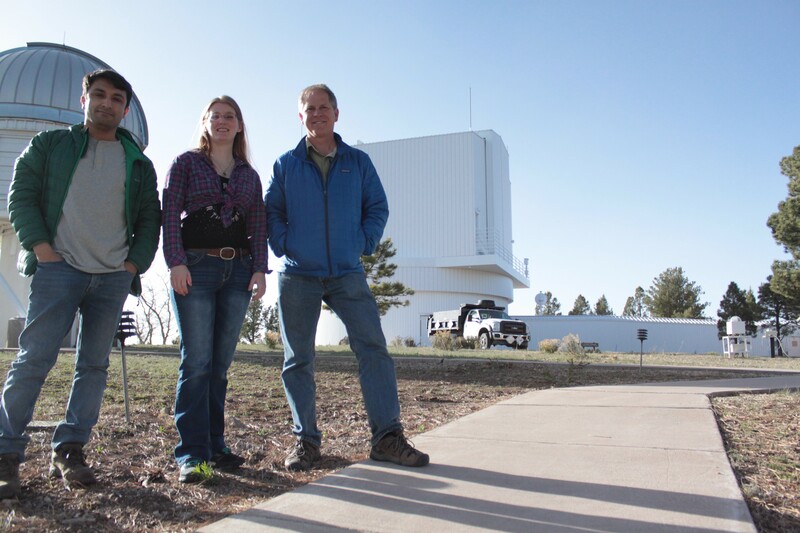 During the middle of March, we observed the first three objects of this Gemini study and analyses are on the way. Shown below is a stacked image of one of these objects taken at three different times during the night. 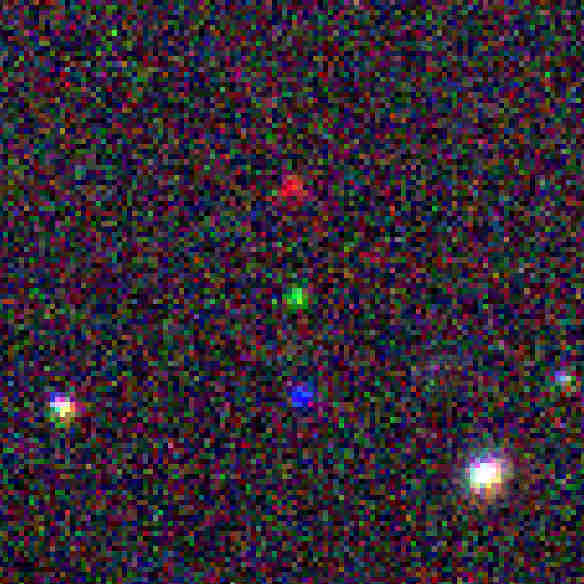 The white objects are stars, while the red, green, and blue dots are the the same object changing positions with each exposure, a TNO moving relative to the background stars! 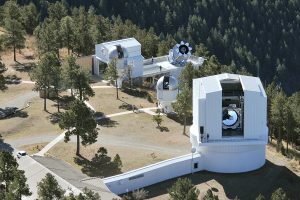 We also have monthly time allocated on the 4.3-meter Discovery Channel Telescope (DCT) at Lowell Observatory in Flagstaff, Arizona, and another proposal was recently submitted to observe more than a 100 TNOs with our Canadian colleagues at the 3.6-m Canada France Hawaii Telescope (CFHT) telescope. 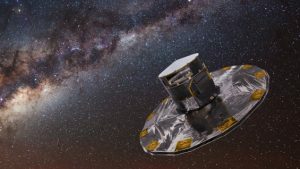 Another important development coming up in less than a month is the second data release of the Gaia mission headed by the European Space Agency on April 25. 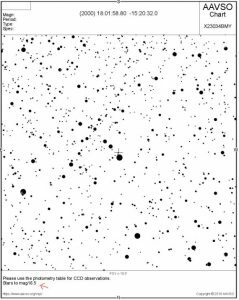 This catalogue will provide ultra-high precision position and proper motion information for over 1.3 billion stars. 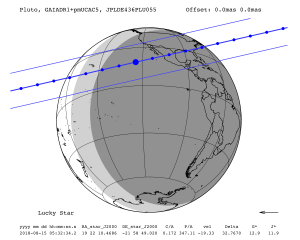 Because occultation predictions depend on known positions of both the target star and occulting object, both the Gaia dataset and our TNO monitoring efforts described above should get us back on track to our proposed cadence of 6-8 occultation campaigns per year by the start of the next school year. So what should RECON teams expect before the start of summer? There are currently five potential TNO campaigns in our prediction system on the following four dates before the end of the school year (5/10, 5/24, 5/25, 6/8, all UT dates). 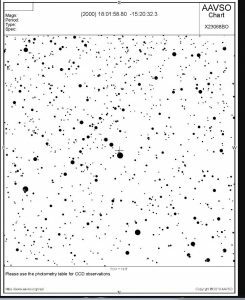 Clear skies permitting, we plan to measure the positions of all five of these objects on April 16-17 from Apache Point Observatory (along with an additional 60ish objects). We will use this data and the Gaia dataset to update our prediction system by the end of April, and we will let our RECON teams know by early May if any of these five become high probability events that we would like to pursue. This is a classic example of how additional and higher quality data can used to obtain better predictions to drive further science. Finally, looking ahead to the summer, it is also very likely that RECON will participate in an important occultation opportunity involving Pluto. 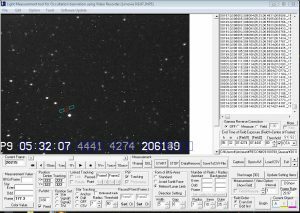 This event will occur on August 15 around 05:32 UT, and RECON is very well positioned to provide valuable data during this event. Additional information on this and other TNO and Centaur predictions is available on the ERC Lucky Star Project prediction page. 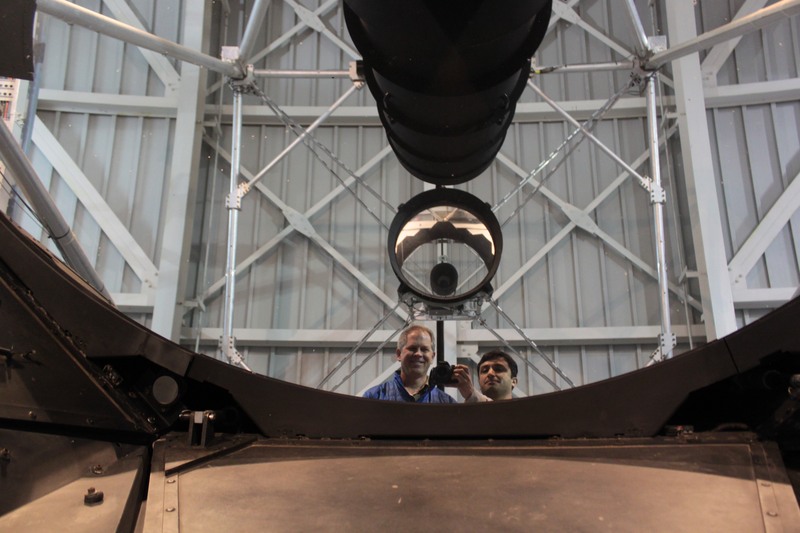 Rodrigo and John are planning to blog from the Apache Point Observatory the nights of April 17 and April 18. We will keep you posted on how this observing run goes and the resulting impact on future TNO predictions. Stay tuned! !